Maybe you love the theatre. Maybe you’ve been looking for a way to honor a loved one. Now’s the chance to honor the arts with a donation to the Take a Seat campaign. Begun with significant renovation of Yardley Hall, Polsky Theatre, the Carlsen Center lobby and the backstage area in summer 2016, Take a Seat continues to offer a unique naming opportunity. 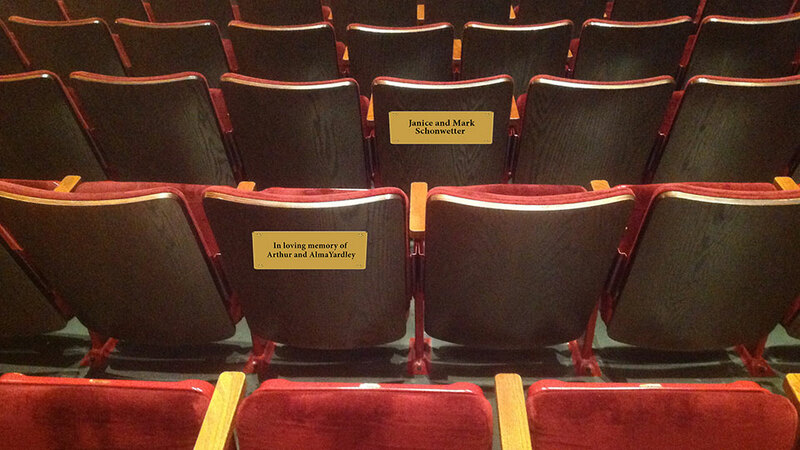 For a donation of $650, your name, your business’s name or the name of someone special to you can be engraved on a plaque on the back of a theatre seat. Donations may be a one-time payment or split into recurring payments. Plaques are installed once the full amount is received. Proceeds support programming that takes place as part of the JCCC Carlsen Center Presents. A contribution to Take a Seat and the subsequent recognition is a naming opportunity only, and in no way guarantees the seat location for any specific performance. All named seats will be in Yardley Hall, Center Orchestra, unless otherwise requested by the donor. Nameplates pictured are not actual size. Greg Musil, chairman of the JCCC Board of Trustees, says he is excited about the naming opportunity. The 1,300 seats in Yardley will be recovered; Polsky’s 420 seats are fine and do not need any work, Behrmann said. Many thanks to the JCCC Board of Trustees for their support of the renovation project.